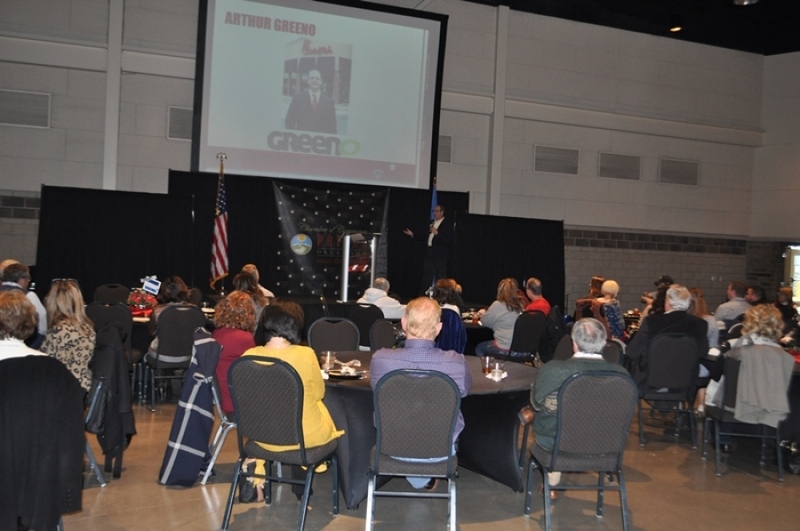 Poteau, OKLAHOMA - Arthur Greeno is the owner/operator of two Chick-fil-A restaurants in Tulsa OK., an Amazon bestselling author, a mentor and a coach was the guest speaker at the Poteau Chamber of Commerce Annual meeting on Jan 29, 2019. Greeno motivated the audience with antidotes about his business plan. Greeno’s Chick-fil-A store in Tulsa holds the Guinness World Record for the World’s Largest Soft Drink, a 834-gallon cup of freshly-squeezed Chick-fil-A lemonade. He is also in the Guinness Book of World Records for the Largest Sweet Tea. Greeno created a nine-foot tall cup holding more than 1,140 gallons of freshly brewed sweet tea and ice. Greeno has been involved with Chick-fil-A for a total of 30 years, with 26 of those years as an owner.